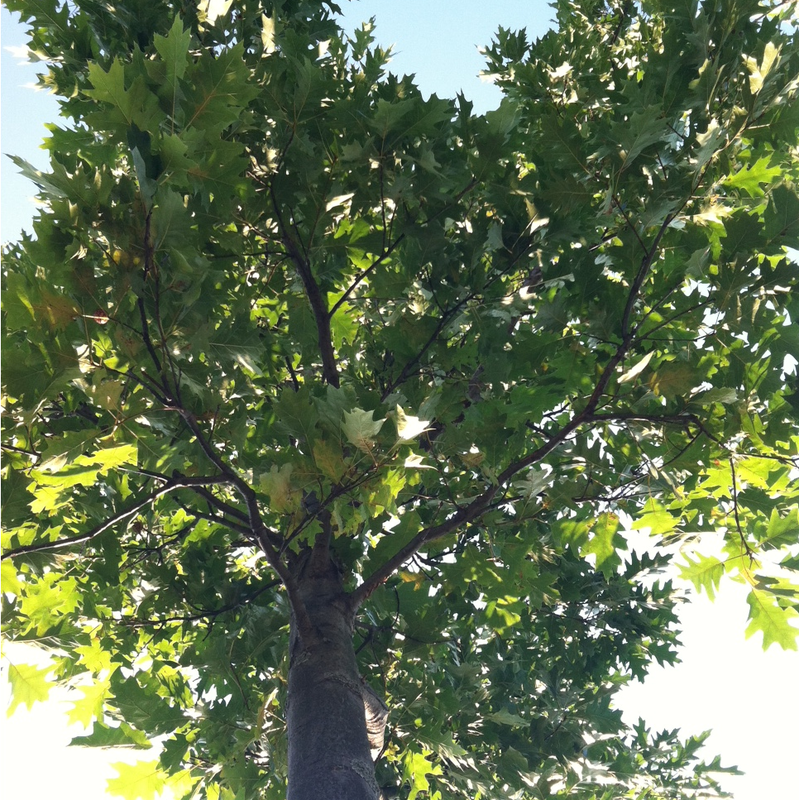 Students - Have you ever stretched out on the grass underneath a tree? I did so yesterday afternoon, and looking up, took this photograph. All evening and maybe even asleep, I thought about this picture. And then, this morning...I suddenly imagined turning INTO a tree. At first, I thought that would be grand to be a tree, but upon writing...I realized that it would be scary too. How strange to not be able to move! One of my early ideas was to write a poem where the tree and I changed places. But once that little black pen took off, it decided not to write about the tree being a person, just about me being a tree. This is something important for us to remember; we do not always know where our pens will go, and sometimes we must follow happily, discovering! Some of my favorite poems are those which take an imaginary journey. It can take my mind a while to free itself up enough to travel into unreal places, but when it does...I am always grateful. You may notice that the last line of this poem also holds the title. Many times, I title a poem after writing it, just letting the title jump out and choose itself. If you teach in a writing workshop district, you might be interested to know that I have just found some video clips of me teaching demonstration lessons in classrooms in Hilton, NY. Feel free to check them out here and to use them for your own staff development if you wish. I will continue to add more as I preview them! 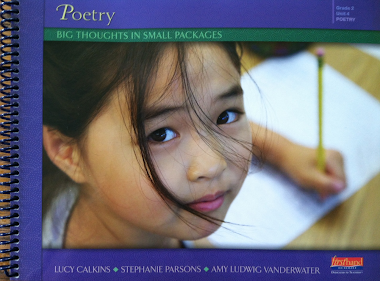 Also, don't forget that you can win a Poetry Friday mini-grant including a copy of THE POETRY FRIDAY ANTHOLOGY as well as a Poetry Friday start-up kit - see here for details with Sylvia Vardell and Janet Wong. 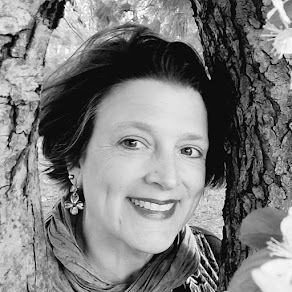 Diane is hosting today's Poetry Friday roundup over at Random Noodling. 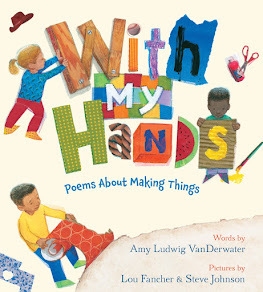 Visit there to see what everyone is sharing today in the Kidlitosphere...it's a poetry party, and all are invited! A poem that both kids and grown-ups can appreciate - shows we're all connected! Very nice...thanks for sharing. So whimsical, Amy! I love "I felt her bird feet tickle me." I playing catch at your blog today and reading several of your posts. I love I Was A Tree Before. How imaginative! My favorite is skipping stones. You really captured it. I skipped stones often in my childhood and still do when I get a chance! Let's has such a great message and should be read and posted in classrooms everywhere. OK...all caught up and had a wonderful mid-morning treat! I'll need to add a bird to my Spark response! Fun! Yes, I could see you as being a tree for one of your past lives. An oak? How about a magnolia? I've led a writing exercise using my "Chow Time" poem from Good Luck Gold ("In another life, I am sure I was a dog"). One child I will always remember said that in another life he was a . . . NOODLE! Maybe it's not so bad being a tree, Amy. Stalwart, adaptable, soaker of light and drinker of rain, the ability to put down roots and drink deeply and anchor soil... . I'm feeling tree-like today! Thanks fr your tree poem! I LOVE this poem, Amy. So beautiful. In a poetry workshop recently, we were talking about when the "monkey" shows up in a poem -- that little weird thought or idea. I'm so glad you followed that thought it this poem. 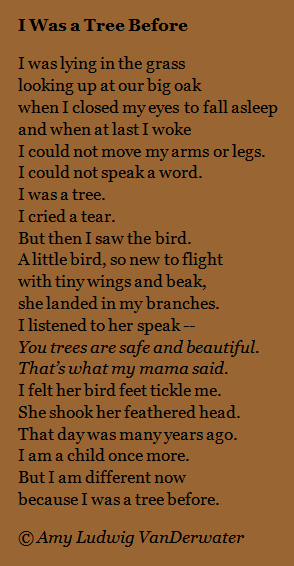 I can just picture the child imagining herself as a beautiful, safe tree. especially that sweet little bird! You have inspired me so often, Amy. I will share this post in my newsletter to my teachers. 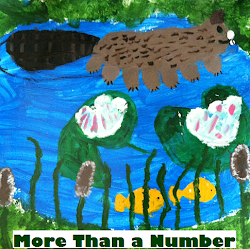 I want them to share in this approach, to see your index, & your invitation of the notebooks. How great it would be for some of our students to share what they do. Thanks for all you new ideas! 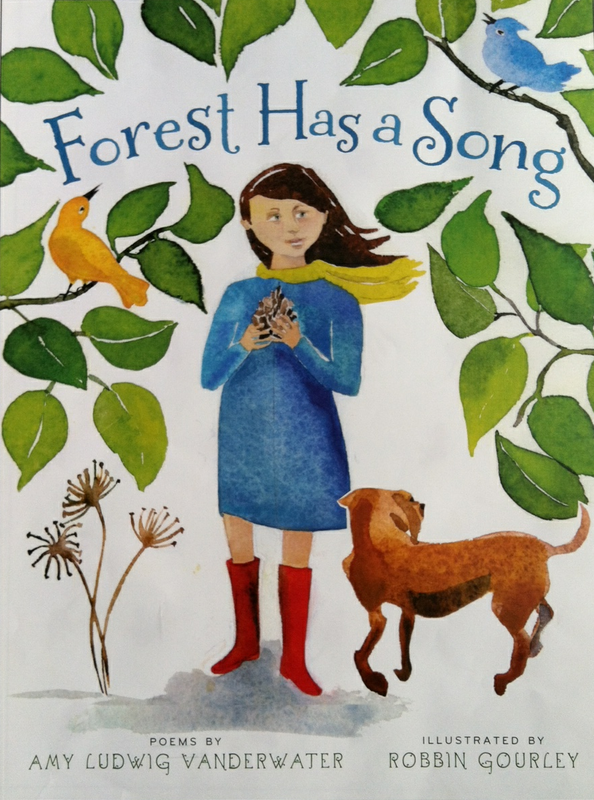 How fun to have your tree poem, and Dori's oak poem, and Liz's acorn poem...all in the same roundup! I love the way this one ends. Those moments of daydreaming and reflection can certainly make us different.